I have always loved lechon kawali, but increasingly find several versions that are either bland and tasteless, overly dry or just way too reliant on the bottled sauces (like sweet liver sauce) that often accompany it. Alternatively, some restaurants seem to soak their meat in an MSG solution that gives it more flavor, but sends you into a post lunch siesta for a couple of hours. 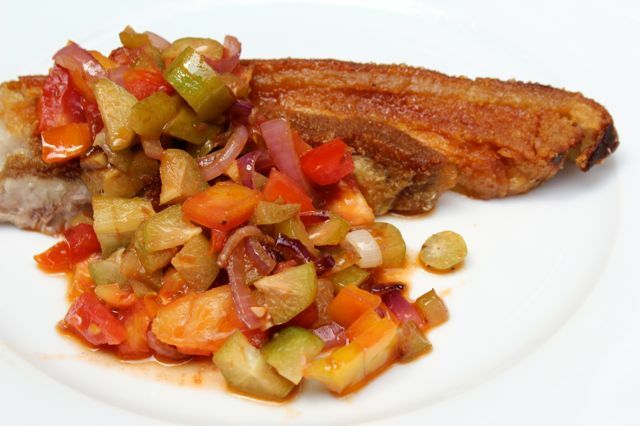 A couple of weeks ago, just as the cook was about to deep fry large slices of pork belly for a homemade version of lechon kawali, I decided to make a “relish” or “salsa” of sorts to serve with the pork. What your mom cooked maybe similar to what we call “sarciado” either with fried pork, fried fish or hard boiled eggs! But I will try your interesting version with Kamias and bagoong added. On bucket list – Cebu, Zubuchon, anything porkie! and get to meet MM and crew!! Missing home! Asa pa to find kamias where I live. And I have to special order liempo at the butcher’s if I want it the way we have it cut in the Phils. This reminds me of how we used to mince kamias from our tree them mix it with patis as our seasoning for pancit palabok. Yum! What type of bagoong MM? isda or alamang? 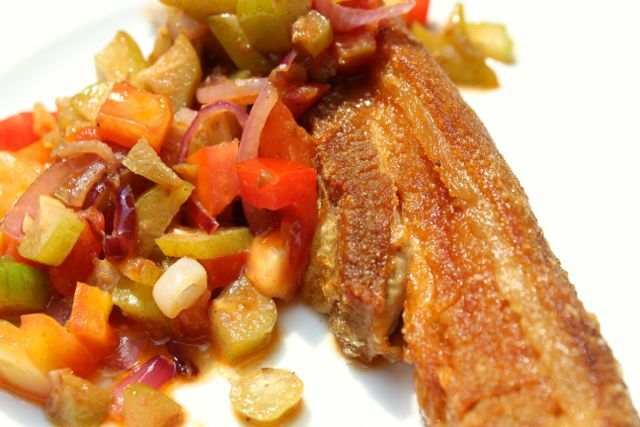 just looking at the picture makes me drool and want deep fried liempo and salsa for dinner tonight…i can taste the liempo already – crunchy, fatty countered with the salsa – fresh, sour, spicy (if chilies are included)…yummy!!! Eto ang tunay na “salsa pa lang, ulam na”! Zena…one of the reasons why I plant tomatillo. Tomatillos make an excellent sub. as well as green tomatoes. I make something similar, then can them. Kumg malapit ka Lang, I will add you to my growing list. oh…minus the bagoong for some of my neighbours are not too keen on smelling our sautéed alamang! I just add the Chinese Bull’s brand barbecue sauce on the side or a little tupperware for my Asian kapitbahays and for our household. MM…there is a famous hole in the wall joint featured of Food Network shows that makes cubed lechon kawali as a filling for their po’ boy sandwich. it is one of their best sellers! So now I’m thinking I can use balimbing which I can find in grocery stores even here in the American south, and maybe heighten the tartness with a squeeze or two of lemon. In any event, thanks for the inspiration! Its been a long time since I had sarsiado with red alamang plus lechon kawali. Lol, my saliva glands went into overdrive as I read this. I can just imagine the taste! Thanks for sharing this MM. Brought back childhood memories too. My grandma used to make Bicol Express using kamias. She’d just put coconut milk, bagoong, luya, sili, bagoong alamang and onions in a pan, and when it starts to boil, add sliced kamias and pork, let simmer until a coco milk turns oily. Yummy with lots of rice! Sorry MM, this is OT. In the poll, did you mean Ferran Adria of El Bulli? MM, I have not had raw kamias in decades! I suppose as a major ingredient in your Zubuchon menu, you get them supplied to your restaurant. Although back in the 80’s and 90’s, our backyard neighbor had a tree whose branches very well crossed over to our side of the fence and they were always chock-full of these tart fruits. We’d grab them by the handful, even casting out the very tiny ones or those that have turned soft, wash them and eat with salt or bagoong isda. Instant crunchy and sour side dish! Living abroad, I miss these free and simple treats. That looks oh so good! I miss iba! To MP above regarding if fresh kamias can be frozen. I live in Sydney and the only whole kamias I have access to are the frozen ones. So, yes, they can be frozen.